I'm still very new here. I tried to post this inquiry a few days ago and can't find it. I must have screwed up. I swear that when you reach 60 all your computer skills vanish. Any help on a possible cause, and whether I need to smooth or polish area would be appreciated. Thanks in advance. I just got one from Aim today, their "worn" one for $149 & when I took it apart it had the same wear. From the position on the bbl. it looks to me like it has been peened from the extractor hitting it. On mine, there is no damage to the extractor (which I assume is harder than the barrel) so I just dressed it slightly with a file & will see how it works. I doubt it is much of an issue. From Above Only & Not Beneath! Thanks. I'm going to see if my extractor lines up with the spot. I'm not near the gun, but visualizing it I see the extractor possibly hitting on the 12 to 3 O'Clock portion as opposed to the 10 or 11 O'Clock position of the chamber. However, I may be totallly off base. I like the 'lightly dressing' idea I was thinking of doing exactly that. I'm not even sure it matters but it suits my compulsive nature to try to 'make it better'. I'm curious to see if there are other responses from folks who have seen this and have the same or other theories as to the cause. I saw the aim reduced price version after I ordered mine. I had a bit of buyer's remorse. I chose 'hand pick' option and paid considerably more. I do feel justified because overall the gun looks fairly pristine. Thanks again. Most of the P-64's have that peened mark. Mine does. It looks to have come from the slide during disassembly. 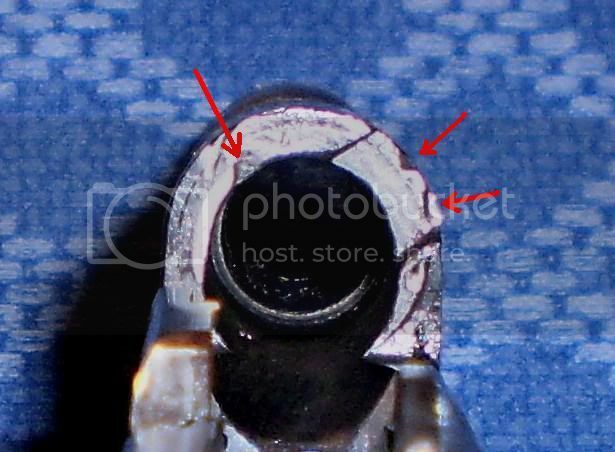 If the slide were lifted up and then ready to be taken off the barrel, but slipped, little nubs on the bottom of the bolt face could have whacked into it. I think this has been discussed on here elsewhere. Just take a look at the slide and visualize how it would line up when it is coming off the pistol and you can figure out what part would have hit the chamber face. I left mine as it is. It doesn't hurt anything. Mine fires and feeds correctly and I don't have any marks on my cases from it. I figure it's best to leave it rather than gom something up. The nubs I'm talking about are clear in the pictures on that post. The nub that got bent and broke off of this guys slide would be the one that can whack into the chamber area. Drop the trigger guard and go to take the slide off. Slowly start to take it off, but watch through the ejector port. Make these nubs like up with the extractor cutout on the barrel. You can see that it fits perfectly. If some inexperienced Polish dude took it apart but had clumsy hands and released the slide during disassembly or reassembly, it could indeed whack the marks in the chamber area at the 10/11 o'clock and the part on the extractor cutaway at the 1/2 o'clock positions. Last edited by juniustaylor on August 31st, 2011, 9:26 pm, edited 1 time in total. I knew I had a picture on here somewhere. Here is a picture I posted of mine. The bottom mark on the extractor cutaway I don't think is from the slide. It looks worse in the picture than it is on the pistol. Definitely not an issue. Shoot the crap out of it. Doesn't bother me because 99% of the time you won't see it as it'll be on the shelf, in the safe, by the bed, on your person, or out shooting it. Rarely will it be apart laying around somewhere. Thanks to all. Without even trying to match up the marks I think Juniustaylor's explanation makes a world of sense. I hate to admit it but I can see myself being ham handed enough to let the slide come forward and ding the chamber. I also feel better about the possibility of just ignoring the issue. If it is even an 'issue'. Thanks again. Now I need to go look at mine! both of mine have minor marks there. think it happens when you screw up when reinstalling the slide. brotip: rotate the end of recoil spring to be at 12:00 before reinstalling the slide, makes it go on a lot easier. this goes for every pp variant out there, from a pa-63 to a makarov to a bersa thunder. Thanks for the tip, legally armed. I replaced the recoil spring, firing pin spring and main spring today and polished the throat (right term?). As long as I was there I dressed the slight ding I originally inquired about. I didn't like the fact that there was actually a small burr on the inner circumference of the chamber. Gave it a good cleaning and I didn't see an cosmoline, just oil. Thank God! The Mosin Nagant took forever to get 'cosmoline free'. Coincidentally UPS just delivered my ammo order. Too bad I have no energy left to drive to the range in 102 degree heat. Brehon1 wrote: Thanks for the tip, legally armed. I replaced the recoil spring, firing pin spring and main spring today and polished the throat (right term?). As long as I was there I dressed the slight ding I originally inquired about. I didn't like the fact that there was actually a small burr on the inner circumference of the chamber. Gave it a good cleaning and I didn't see an cosmoline, just oil. Thank God! The Mosin Nagant took forever to get 'cosmoline free'. Coincidentally UPS just delivered my ammo order. Too bad I have no energy left to drive to the range in 102 degree heat. both my p-64's arrived coated in thick oil which was easy to remove and replace with my lubricant of choice. my makarov was packed with crusty old cosmoline like a mosin, god what a pain. my pa-63 looked brand new, and had no oil or cosmo anywhere, just needed to be lubed up. my cz-82's were coated in the same thick oil the p-64's were. p-83's had thick oil too. interesting to see how the different countries stored these things. (it's also interesting how it seems pa-63's were all built and never issued. i've never seen anyone receive one from a surplus site that wasn't 100% new). May not be too helpful with handguns... The trick I used with my mosin was to box the stock back in the box it arrived in surrounded by kitty litter, wrap that in black plastic and leave it in the hot sun, flipping every so often. (I have also heard of people stowing the boxed parts in a hot car.) I was amazed how the stock 'sweat' the cosmoline into the kitty litter. It came out 2 shades lighter! I haven't experienced the continual 'weeping' cosmoline that some folks deal with after cleaning up their rifles. Of course this only works when the temperature cooperates. I am 'lucky' enough to be in Arizona where heat and sun are not in short supply. Brehon1 wrote: May not be too helpful with handguns... The trick I used with my mosin was to box the stock back in the box it arrived in surrounded by kitty litter, wrap that in black plastic and leave it in the hot sun, flipping every so often. (I have also heard of people stowing the boxed parts in a hot car.) I was amazed how the stock 'sweat' the cosmoline into the kitty litter. I sweated the cosmo out of a PSL stock set from a parts kit that way, only I didn't think to use kitty litter. I wrapped it in paper towels and improvised an oven with a drop light and the box the kit came in. I used a cooking thermometer to monitor the temperature and kept an eye out for smoke, but I didn't have any smoke or flames. For the metal parts, dunking them in boiling water seems to get the worst of it off. The cosmo melts free and floats to the top like oil. After that, a toothbrush and a bottle of mineral spirits took care of the rest.